A young man called Christopher Maloney from Liverpool recently auditioned for X-Factor UK. At the beginning of his audition he was the most nervous contestant the judges had ever seen and he repeatedly said everyone had tried to persuade him not to go on the show because they said he wasn't good enough. Christopher Maloney is a great example of why you really need to believe in yourself. If you don't believe in yourself there is absolutely no way you will ever be able to achieve your dreams and take your rightful position in life. Most of you will have had that small voice inside your heads that has told you on so many occasions " You can’t do it. You’ll never be good enough. You’re going to fail." This voice taunts you every time you set yourself a goal and criticizes you when life gets difficult. It fights so hard when you try to ignore its running commentary. You are very well aware that you must believe in yourself and that you shouldn't let self doubt bother you but still there are times when you simply cannot control it and you let it get to you. The more you struggle against your self-doubt, the more it fights back. Don't give up,, with self-knowledge and understanding of the problem, you can use self-doubt for your benefit and really start to believe in yourself. No longer tell yourself, “I’ll never be good enough.” Instead, I ask yourself, ”What can I do to become better?” And then take baby steps. Self-doubt doesn't have to be as all controlling as we make it out to be. It’s all about perspective. The following tips will help you manage your self-doubt and start to believe in yourself. It is really important to be able to recognize when your self doubt is becoming critical. When you hear yourself saying, “I can’t,” or, “I don’t know,” or, “What if,” a red flag should go up. Doing this continually will really change your negative mindset into an opportunity for growth and will in the end result in a growing ability to believe in yourself. To Believe In Yourself Stop Listening To Negative People. Negative people will always tell you that everything is impossible,and are quick to shoot down your ideas and dreams. If you listen to them they’ll soon put you into a state of hopelessness. Don’t let such negative people sap your positive energy just because they've lost theirs. Stay positive and believe in yourself. Stay positive and surround yourself with supportive and passionate people who will inspire you and bring out the best in you. You can find them among friends, family, books, or blogs and if you really want to be part of a positive and supportive group of really amazing people then you should be a member of Empower Network. It is the support and help that you get from all your fellow members in Empower Network that will ensure that you stay positive and believe in yourself thus ensuring your total success in your online businesses. Positive people and especially your team members when you join Empower Network will lift you up when you feel down and help you see the bright side of your darkest fears and doubts. You are now starting to really believe in yourself. To Believe In Yourself Frequently Recall Your Successes. A great suggestion is to write a list. Have a small notebook or open a blank document on your computer and write down all your successes, big or small. If you’re a bit shy about your achievements, ask someone you trust to tell you the great things they think you've done. It’s refreshing and a great confidence booster when you need to start to believe in yourself again. To Believe In Yourself You Must Trust And Love Yourself. Many of us are our own worst enemies but you should remember that you deserve to treat yourself better especially when you realize that, you have the rest of your life to spend with yourself. Would you mentally abuse or condemn your loved ones? Would you let them suffer in their time of need? If not, then why would you do it to yourself? So, be kind to yourself. To Believe In Yourself You Must Try…And Try Again. Something may go wrong for sure, but if you never try, you’re losing an opportunity to improve your life so just try and try again with the firmly believe in yourself that you will eventually succeed..
An additional benefit you will have as a member of Empower Network is that you will be able to join a weekly webinar every Monday where you will be with thousands of positive minded people just like yourself and hear inspirational messages to help you stay positive also. 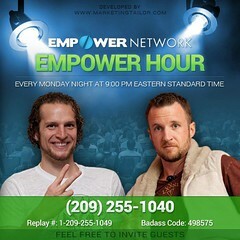 This Empower Hour Webinar will revitalize you and you will be encouraged to try again.